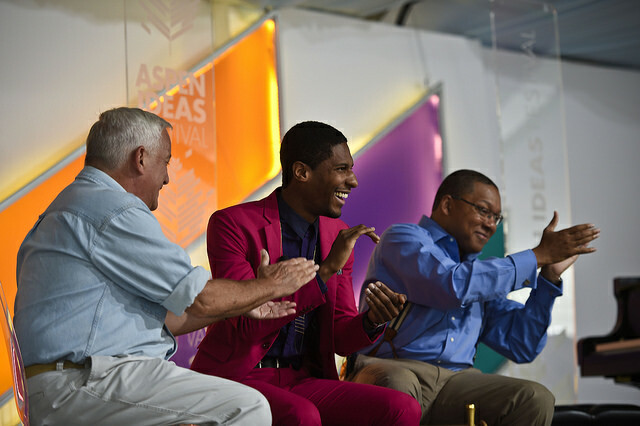 One of the great privileges working for the Aspen Institute is to attend the Ideas Festival - which ended with a satisfying chorus on July 4th. I leave infused with fresh ideas and connections to build on the next year. My advice for newcomers: skip the pundits and lean in to innovative change agents -- the "makers" who work across the spectrum of business, arts, education and politics. You know an event is a success when your hope for the future is renewed. When an idea goes viral: While the crowds surged into the big tent to see Katie Couric interview David Brooks on his recent book on Character, I chose the lesser path and joined a small but grateful audience to hear Reza Aslan, author of Zealot: The Life and Times of Jesus of Nazareth, talk about "The Jesus of History versus the Christ of Faith." Aslan uses PowerPoint as art. His talk reminds me of the great power of ideas. In the right moment, in context, we have the potential to rewrite the narrative -- to shift the conversation to a different place. It helps if the actors involved are gifted storytellers -- like Welch and Aslan, but in the right moment, when the conditions are ripe for change, extraordinary things can happen. Hope to address Climate Change: One of those moments took shape before my eyes watching Ronald Brownstein's masterful interview of Tom Steyer on "Why California is Leading the United States in Energy Innovation." Steyer's key point? Get cracking and utilize a pricing mechanism to enlist markets and address climate change before it is too late. Watch to the end of the interview to see Tom mix it up with his nemesis David Koch -- who had listened from the front row. A true Aspen moment. What is an employee worth? And then roll the tape on another disrupter -- Dan Price, who has earned more than ten minutes of fame by cutting his own pay as CEO and raising wages in his Seattle tech company, Gravity Payments: "The 70,000 Minimum Wage." Dan's thoughtful analysis of the business drivers behind the real value of his employees has created waves in the market and across the airwaves. Watch this space! Jazz -- a metaphor for America: Finally, don't miss the grand finale with three New Orleans natives -- Walter Isaacson's interview with masters of the art of jazz, Wynton Marsalis and young Jon Batiste (who will soon join The Late Show with Stephen Colbert as bandleader.) Jazz, in all its complexity, is a metaphor for what makes this country great: ingenuity, innovation, collaboration, call and response, and syncopation -- bound by rhythm and melody. Watching Marsalis on stage on the 4th of July, while he listens to young Batiste play his rendition of "The Star Spangled Banner," is a wonderful moment -- and a reminder of the great stew of the United States, where infinite possibilities for change and innovation still reside. What is possible now?